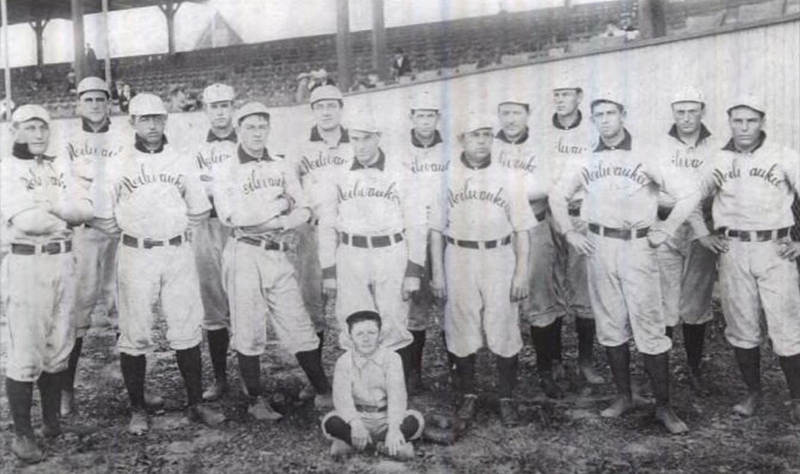 The 1904 Milwaukee Brewers. Under the leadership of Wisconsin-born Joe "Pongo Joe" Cantillon, the Brewers finished in third place with a record of 89-63 in 1904. From left to right: Team Captain Germany Schaeffer (ss), Cliff Curtis (p), Jack Slattery (c), Quarte Bateman (p/1b), Lou Manske (p), Tom "Sugar Boy" Dougherty (p/of), Elmer "Spitball" Stricklett (p), Art Pennell (of), Kid Speer (of) and Harry "Pep" Clark (3b). Team mascot "Little Hans" is seated. Pongo Joe led the Brewers to a second-place finish in 1906, and was hired away from Athletic Park to run the Washington Nationals. I love these jerseys, with the elegant arched "Milwaukee" script. White jerseys with a blue wordmark and collar. 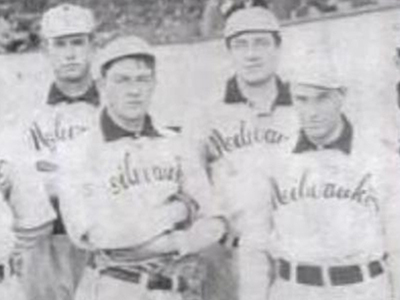 Through a couple shades and three teams in as many leagues, blue has been Milwaukee's baseball color since at least the beginning of the 20th Century. It's my understanding that these uniforms were worn in 1903 and 1904. The Brewers wore block letters in their first year, and moved back to them in 1905. Shame, this would have been a gorgeous and iconic look for the Brewers to establish during their years in the Cream City.